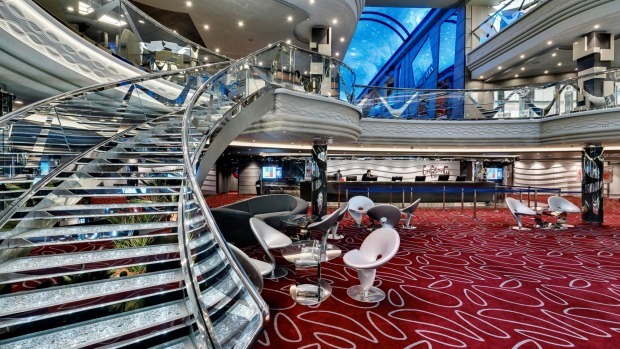 One of the most photographed spaces on MSC Cruises' grand, modern ships is the staircase. Why? Each step sparkles with thousands of dollars' worth of Swarovski crystals, one of many extravagant features ordered by the company's co-owner Rafaela Aponte. Aponte and her husband, Gianluigi Aponte, are the billionaires at the helm of the world's largest privately-owned cruise company, one that is expanding at a dizzying rate. In June the line launched its 15th ship in 14 years, MSC Seaview, sister to 2017's MSC Seaside. Both ships have a maximum capacity of 5429 passengers and are slightly smaller in tonnage and capacity than MSC Meraviglia, which also launched in 2017. Seaside and Seaview are the first of the Swiss-based line's ships to be "purpose-built" for the North American market; until recently, MSC Cruises sailed mostly in the Mediterranean, South Africa and the Arabian Peninsula. At the moment, most of MSC's Australian passengers choose the Grand Mediterranean itinerary, a 14-night cruise combining the best of the West and East Mediterranean. The line is particularly family friendly – kids under 12 travel free of charge – and the ships are packed with kids' clubs, entertainment and activities such as zip lines, bowling alleys, pools, waterparks and sports tournaments. MSC has a formidable line-up of partnerships, from Cirque du Soleil to a raft of top chefs, Lego and Chicco for kids' clubs and facilities, and Technogym in the state-of-the-art fitness centres. The ships come in five different classes – Musica, Fantasia, Meraviglia, Meraviglia-Plus and World Class. The exclusive "ship within a ship" private-access area MSC Yacht Club was introduced on the Fantasia ships (Fantasia, Splendida, Divina and Preziosa), built between 2009 and 2013, and is a major feature on all the ships built since. The company is investing €11.6 billion in its expansion plans and by 2026 it will have added another 10 ships to the fleet. Three are being built simultaneously at Chantiers de l'Atlantique in France; MSC Bellissima and MSC Grandiosa will be launched in March and November 2019 respectively, with MSC Virtuosa launching in 2020. Another seven ships are scheduled to arrive between 2021 and 2026. MSC Bellissima will spend its inaugural season in the Mediterranean, then relocate to the Arabian Peninsula in November 2019. It is a sister ship to Meraviglia; Grandiosa will be the first in the Meraviglia-Plus class, which will accommodate up to 6300 passengers. Grandiosa will have an extended promenade, where you can stroll, shop and eat under an extraordinary, ever-changing Sky Screen; it will also sail in the Mediterranean. WHO GOES THERE Cunard, HAL, Hapag-Lloyd, Oceania, P&O, Princess, RSSC, Seabourn. WHY WE LOVE IT It's the capital of Milne Bay Province and the first stop on most PNG cruise itineraries. Alotau is a working port for small ships, boats and canoes from 160 surrounding islands and the region is best known for its role in World War II and as a gathering place for tribal clans. Cruise passengers are welcomed at the dock by friendly locals in full warrior garb. TAKE A TOUR OR GO IT ALONE? Guided tours are the best way to go in Alotau. P&O is the most frequent visitor to the town and offers a good range of tours. They include a full day trip to Tawali Resort (note that the bus trip is 90 minutes each way) for snorkelling and the skull caves; and half-day tours to Huhu district, home of the war canoe and centre of the former cannibalistic hinterland, and to Driftwood Resort for kids' activities such as fishing and canoe-paddling, plus snorkelling around a shipwreck. Other options include the two-hour Battle of Milne Bay cruise; Alotau Cultural Festival, a mini-version of the annual Canoe and Kundu Festival that is held every November; and village tours where you can join family activities and see demonstrations of traditional crafts. MUST SEE For WWII history buffs (and anyone interested in learning more about the Pacific side of WWII), the John French Memorial Site and Turnbull War Memorial. Top Town Look Out for sweeping views of Alotau and Milne Bay; Town Market for a slice of local life. MUST EAT A few tours include sampling local food, in private homes or at a cooking demonstration in Masurina Lodge, where you help prepare lunch then eat it. Try dishes cooked in claypots, such as taro, banana, cassava yam and vegetables; there's also an abundance of fresh tropical fruits. NEED TO KNOW PNG's currency is the kina. Change money before you leave Australia and ask for some small denomination notes, as they are not always available onboard. Holland America Line's Nieuw Statendam, launching in December, will be the sixth ship to carry the name Statendam and the 15th ship in the current fleet.